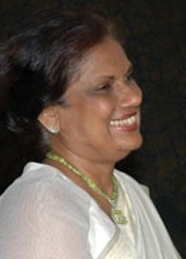 ↑ "BBC Profile: Chandrika Kumaratunga". BBC News. 26 August 2005. http://news.bbc.co.uk/2/hi/south_asia/3239821.stm. ↑ "Chandrika awarded France’s Highest National Honour" (enमे). Daily News. http://www.dailynews.lk/2018/09/21/local/163295/chandrika-awarded-france%E2%80%99s-highest-national-honour. ↑ "Chandrika Kumaratunga: Politics in the blood". BBC News. 9 October 2000. http://news.bbc.co.uk/2/hi/south_asia/566562.stm.